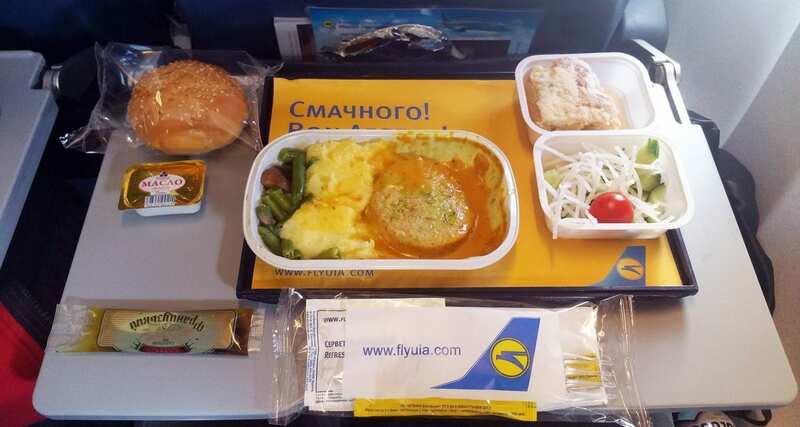 On a recent trip to Greece I decided to fly the long way and overnight in Kiev to test out the Ukraine International pre-order meals for economy class passengers. The airline doesn’t offer free meals in economy class on most European flights; you can make purchases from the inflight menu onboard or pre-order a meal during the flight booking process online. The meal itself cost EUR9.00 which isn’t too bad when compared to similar meals, however when you pay for a meal in economy the airline will usually spend a bit more money on the concept, or give you an upgraded meal experience. This was your typical economy class airline food tray that you could get on any airline for free normally. The meal itself wasn’t that appealing at all; it was meant to be a chicken burger dish, the chicken was swimming in a brown/orange sauce and didn’t look appealing. The dessert was created with low-quality ingredients, and the salad was probably the only thing edible. Probably one of the worst meals of 2016 so far!